Prayer Pause is a community outreach ministry inviting people, both inside and outside our Church, to stop and pray for people in our community, our nation and our world. 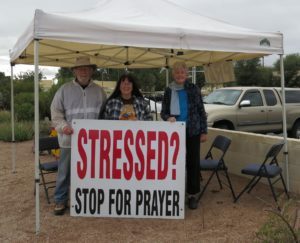 On Saturday mornings, from 9 a.m. to 12 p.m., a canopy is put up by the street in front of the church inviting people to stop and pray. Christ prayed and Christ taught us to pray. Every Sunday before church, a group of FOL members gather to pray. Guided by a set of 16 points that assure that the group is focused and cover all needs, the group offers prayers to God, prayers for the pastor, Fountain of Life, its ministries, people and staff. We also pray for all the people who work and volunteer in the church daily, weekly, and monthly, including praying for the special needs and events of the church. 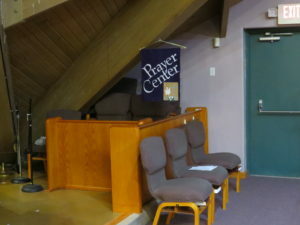 If you are in need of a special prayer, there will be someone available at the Prayer Center in the Northwest corner of the Sanctuary following each weekly service on Saturday and Sunday. A “Prayer” member will be happy to pray for you or with you according to your needs.